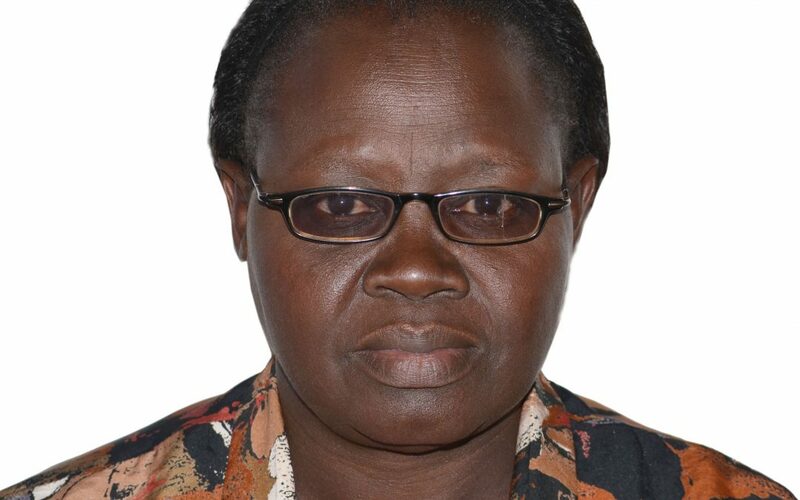 My name is Jane Nyokabi Gitau, and I am 59 years old. I come from Gitare Village, Kiamworia Location in Kiganjo ward. I am a mother of three boys and two girls, and a grandmother of four. In 2003, I was trained as a Community Based Health Worker and Traditional Birth Attendant by the then Ministry of Public Health in the larger Thika District but I did not have any leadership qualities and I had very little courage. In the same year, GROOTS Kenya trained a group of 10 women from a neighboring village on Home Based Care. We came together and wrote a proposal to the National Aids Control Council (NACC) Kenya for funding in aid of training to gain proper capacity on caregiving since the AIDS pandemic had really affected our community, we used the same group to offer training to hundreds other caregivers. Before I joined G.K. in 2003 I was a subsistence and coffee farmer using traditional farming practices. I had also started 3 ‘merry go round’ groups for widows. When I joined GROOTS Kenya, I found a welcoming atmosphere which helped me articulate the needs of my community and grow as a leader. I became passionate about supporting the vulnerable especially widows, orphans and elderly people. After a lot of training, I was able to offer care and support to people infected and affected by HIV/AIDS, linking them with health facilities and safeguarding their rights and those of widows and orphans whose right to property and land had been violated. We worked at reducing HIV AIDS prevalence rate, reducing stigmatization, formed support groups for therapy for the bedridden, worked with stakeholders especially the Ministry of agriculture to improve farming and improve livelihoods and partnered with cultural leaders to eliminate harsh practices on women and the vulnerable. In 2006, I became the Chairperson of the Gatundu district HBCA and through GROOTS Kenya’s support in capacity building workshops, exposure meetings and exchanges with other regions, I started working as a member of the Watchdog group. This helped me deal with my own land issues and I later became the sole administrator of my father in law’s estate despite being a woman and a widow in a family who thought that women did not have any right whatsoever even to purchase a piece of land. My capacity in partnering with different stakeholders was enhanced, I overcame intimidation and fear and gained a lot of courage in handling difficult situations. GROOTS Kenya supported us with new projects and civic education forums that played a key role in changing the mind set of the community. I am now educating my children without relying on anybody and improving my farming methods to become a resilient farmer and realize increased production. We now have women and men champions sitting in positions of decision making crosscutting various departments and sectors, women leadership has been accepted and embraced, cases of disinheritance have reduced and leaders have recognized the role played by GK through the grassroots women and men. I am a member of the peace committee, I recently joined the Coffee sector as a farmers co-operative society management executive member. I am in the Management of the local dispensary which has now grown to a level 3 health center. We lobbied community professionals and leaders to support the purchase of a plot where the CDF has now constructed a staff house. I have been the project treasurer all these years and participated in the social audit of all CDF projects in Gatundu south. GROOTS Kenya champions lobbied for space and we were granted a plot to put up our office by the local government. I have been the chairperson of Gatundu Mwirutiri women initiative and in my leadership we were granted Towa funding at a district level for behavior change campaigns which played a great role in reducing new infections. I have attended both Local, National and International meetings and conferences which have further strengthened my capacity mostly on HIV/AIDS, land rights and I have participated in talks on the New Framework of Action; The Sustainable Development Goals and the Kenyan constitution. I played a key role in the initiation and strengthening of the home-based care alliance in South Africa, India, Zambia, Malawi and Uganda. I have nothing but admiration for this great movement that has instilled a lot of knowledge and exposure in me. Five years to come I see the movement spreading to all the counties, and a country where gender equality will be realized and women recognized as worthy leaders.